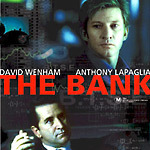 Much like Pi, the 1999 American film from Darren Aronofsky, The Bank is about a mathematician who finds a way to predict trends in the stock market. Instead of a dark and poetic art-house favorite, The Bank is an approachable, mainstream thriller. Two stories unfold in The Bank. The primary one follows our mathematician Jim (David Wenham), who is taken under the wing of greedy banker Simon O’Reilly (Anthony La Paglia). After an initial test in which Jim’s mathematical model earns 900,000 bucks in half an hour, Simon sets up a computer lab — the best in the southern hemisphere — for Jim to work in. The second story is of a couple who run a little houseboat business. They took a foreign currency loan and, because of factors beyond their control, lost their business and their home. Are these characters the butterfly flapping its wings in China? Will they affect Jim’s mathematical model in some way? The movie doesn’t tell us exactly how they relate to Jim and Simon’s story — at least not yet. The middle act of the film shows Jim refining his computer program so that it becomes even more accurate, as Simon readies his bank for a big, sudden play in the global stock market using Jim’s formula. Meanwhile, Jim has taken a fancy to Michelle (Sibylla Budd), an account manager at the bank who survived the last round of layoffs. A fairly satisfying twist at the end lets The Bank end on a positive note. But throughout the rest of the movie are flaws and problems that subtract from the balance. The premise is farfetched. “The Stock Market” is not just one number, moving up and down on a graph, it’s thousands of numbers. The best anyone can hope for is a sort of general prediction, which Jim in fact has in his earliest demonstration. The movie would have been better off sticking with this general predictor. But later, Jim’s tool gets so good that it predicts the exact composite index, second by second. The movie fails to explain, in spite of several big technical-sounding words, how such a thing can be possible. Two other logic holes were noteworthy. First, Simon repeats that by playing the market right, he will wipe out his competitors. But the market is not a zero-sum game. One person’s win is not necessarily another person’s loss. Simon’s greed is understandable, but his hatred and aggression toward competitors doesn’t make sense. Jim’s motive is just as senseless. He says he developed the formula to help the world, including the little guy, by predicting bad market crashes. But if investors believe Jim’s bad news, there will be a run on the markets, causing a crash, hurting the same people Jim thought he was going to save. Finally, the movie’s satisfying twist reveals that, without the twist, the middle of the movie would have been completely boring. The film could only make sense as a dramatic narrative, with the twist. Audiences sharper than I will no doubt pick up on this and predict the ending sooner than I did. So even though The Bank may be more approachable than Pi, it’s not more recommended. I suppose it’s not a bad film. The thrill works pretty well, and all throughout, my emotional involvement with the characters was suitably intense, even if I didn’t know how they would all come together. It’s also a good look at the sleazy side of big business, a portrait of the rise of “corporate feudalism. Maybe The Bank is worth seeing for some of those reasons. Then again, none of these reasons alone are enough to make a trip to The Bank.